DNA analysis shows that Indonesian zebu cattle have a unique origin with banteng (Bos javanicus) as part of their ancestry. Throughout the world, cattle inhabit a range of climatically diverse environments: common taurine cattle, for example, are kept in temperate zones, zebus in hot, dry climates and yaks at the high altitudes of Tibet. A report published by the online, open-access, peer-reviewed journal PLoS ONE shows that another bovine species, the banteng, also made a genetic contribution to the ancestry of Indonesian cattle. The study, conducted by an international team of researchers, was led by Bambang Purwantara from the Bogor Agricultural University, Hans Lenstra and Ben Colenbrander from the Faculty of Veterinary Medicine, Utrecht University, and Göran Andersson from the Swedish University of Agricultural Sciences in Uppsala. Cattle from Bali were already known to be a domestic form of the banteng, a species which can remain very fertile in the tropical conditions it inhabits. On the sporadic occasions when a banteng mates with a zebu, the offspring are usually reproductively viable. 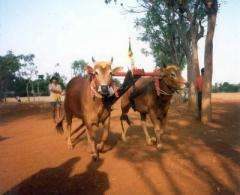 In the PLoS ONE study, DNA analysis now shows that many of the famous 'racing bulls' from Madura descended from banteng cows, while the ancient Galekan cattle on East Java originally emerged from crosses between zebu bulls and banteng cows. The DNA of zebus on Sumatra also carries clear traces of banteng DNA. Banteng cows have therefore played an important role in the genetic ancestry of many Indonesian cattle. This shows the ingenuity of local breeders, who have made the best use of the available genetic resources and accomplished an adaptation of the Indian zebu to Indonesian conditions. The history and breeding of Indonesian cattle has resulted in a unique genetic resource that combines the general tolerance of zebu to tropical and dry climates with the adaptation of domestic banteng to Indonesian conditions and husbandry. The researchers report that the information in their study about the history and species composition could be of great use when making strategic choices regarding breed management and conservation. They also suggest that the adaptation of Indonesian cattle to different modes of management under tropical conditions may very well be exploited outside Indonesia, especially if the world's high temperature zones expand, as expected from current global climate trends.